German Chamber of Industry and Commerce in Vietnam in coordination with Mess Dusseldorf and Vietnam Plastic Association organized the conference themed “Current situation of global plastic and rubber industries, trend development of plastic machineries and raw material sectors. An overview of K 2016 – International trade fair No.1 worldwide for plastic and rubber industries in Germany” on March 2, in Sai Gon Exhibition Convention Center, District 7, HCMC. In the 2010 -2015 period, the plastic industry was one of the country’s key industrial sectors with its growth rate from 16 percent to 18 percent per year (only behind telecommunications and garment & textile sectors). According to Chairman of the Vietnam Plastic Association, Ho Duc Lam, in 2015 alone, the plastic industry manufactured & consumed nearly five million tons and Vietnam’s plastic products were exported to 159 countries & territories worldwide including high demand markets such as Japan, the U.S, Germany, Thailand and the European with growth rate of 12,4 percent over previous year. The export turnover of plastic products reached US$ 2.405 million last year. However, Mr. Lam said although the plastic industry has developed strongly in the recent years but it is appreciated as a technical economic industry depending on outsourcing because plastic industry has to import from 85 to 90 percent of input material to meet production demand every year. In addition, domestic plastic industry needs average 3.5 million tons of input raw materials such as PE, PP, PS… and hundreds of subsidiary chemicals. It is estimated that the country’s plastic enterprises will need about 5 million tons of raw materials to meet their production demand by 2020. “To take advantage of integration situation, the country’s plastic enterprises should improve and invest new technologies, production chain, focus on environmentally friendly and safe products, aiming to enhance the industry’s higher export value & sustainable growth”, Mr. Lam confirmed. The Chairman added that K 2016 will be good opportunity for plastic enterprises to exchange and seek partners & new cooperation. Mr. Gernot Ringling, Managing Director of Messe Dusseldorf Asia hoped Vietnam plastic enterprises will be able approach new technologies through K 2016 which is scheduled to take place in October in Germany. K 2016 will introduce new trends of plastic & rubber industries including resource efficiency; higher material efficiency & availability; Zero waste production; light weigh construction and additive manufacturing. 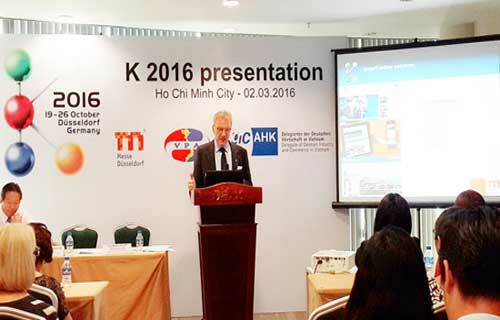 Mr. Gernot Ringling said K 2013 attracted around 200,000 visitors across the world, of these, there were 800 Vietnamese enterprises.